Myers Preserve - Haddam Land Trust, Inc. The Myers Preserve in Haddam Neck is made up of three separate properties. The Myers Property, donated by Robert Myers in 1996, consists of 2 lots that sandwich the Koskoff Property, which was subsequently donated to the Haddam Land Trust in 1997. 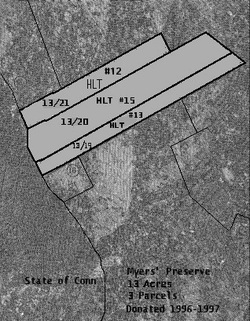 The two Myers parcels consist of approximately 6 acres and the Koskoff parcel is approximately 7 acres, bringing the total acreage to 13. The preserve is landlocked but can be reached by walking down from the end of Clarkhurst Road in Haddam Neck and crossing over Dudley Seymour State Park. The Myers Preserve, rising out of the great swamp, Higganum Meadows, offers a view of Higganum from a height of about 160 feet above the Connecticut River.